OProfile is a low overhead, system-wide performance monitoring tool. It uses the performance monitoring hardware on the processor to retrieve information about the kernel and executables on the system, such as when memory is referenced, the number of L2 cache requests, and the number of hardware interrupts received. On a Fedora system, the oprofile package must be installed to use this tool. Many processors include dedicated performance monitoring hardware. This hardware makes it possible to detect when certain events happen (such as the requested data not being in cache). The hardware normally takes the form of one or more counters that are incremented each time an event takes place. When the counter value increments, an interrupt is generated, making it possible to control the amount of detail (and therefore, overhead) produced by performance monitoring. OProfile uses this hardware (or a timer-based substitute in cases where performance monitoring hardware is not present) to collect samples of performance-related data each time a counter generates an interrupt. These samples are periodically written out to disk; later, the data contained in these samples can then be used to generate reports on system-level and application-level performance. Use of shared libraries — Samples for code in shared libraries are not attributed to the particular application unless the --separate=library option is used. Performance monitoring samples are inexact — When a performance monitoring register triggers a sample, the interrupt handling is not precise like a divide by zero exception. Due to the out-of-order execution of instructions by the processor, the sample may be recorded on a nearby instruction. opreport does not associate samples for inline functions properly — opreport uses a simple address range mechanism to determine which function an address is in. Inline function samples are not attributed to the inline function but rather to the function the inline function was inserted into. OProfile accumulates data from multiple runs — OProfile is a system-wide profiler and expects processes to start up and shut down multiple times. Thus, samples from multiple runs accumulate. Use the command opcontrol --reset to clear out the samples from previous runs. Hardware performance counters do not work on guest virtual machines — Because the hardware performance counters are not available on virtual systems, you need to use the timer mode. Enter the command opcontrol --deinit, and then execute modprobe oprofile timer=1 to enable the timer mode. Non-CPU-limited performance problems — OProfile is oriented to finding problems with CPU-limited processes. OProfile does not identify processes that are asleep because they are waiting on locks or for some other event to occur (for example an I/O device to finish an operation). OProfile.adoc#tb-oprofile-tools provides a brief overview of the most commonly used tools provided with the oprofile package. Displays available events for the system’s processor along with a brief description of each. Converts sample database files from a foreign binary format to the native format for the system. Only use this option when analyzing a sample database from a different architecture. Creates annotated source for an executable if the application was compiled with debugging symbols. See OProfile.adoc#s2-oprofile-reading-opannotate for details. Configures what data is collected. See OProfile.adoc#s1-oprofile-configuring for details. Recommended tool to be used in place of opcontrol for profiling. See OProfile.adoc#s1-using-operf for details. For differences between operf and opcontrol see OProfile.adoc#s2-operf_vs_opcontrol. Retrieves profile data. See OProfile.adoc#s2-oprofile-reading-opreport for details. Runs as a daemon to periodically write sample data to disk. There are two mutually exclusive methods for collecting profiling data with OProfile. You can either use the newer and preferred operf or the opcontrol tool. This is the recommended mode for profiling. The operf tool uses the Linux Performance Events Subsystem, and therefore does not require the oprofile kernel driver. The operf tool allows you to target your profiling more precisely, as a single process or system-wide, and also allows OProfile to co-exist better with other tools using the performance monitoring hardware on your system. Unlike opcontrol, it can be used without the root privileges. However, operf is also capable of system-wide operations with use of the --system-wide option, where root authority is required. With operf, there is no initial setup needed. You can invoke operf with command-line options to specify your profiling settings. After that, you can run the OProfile post-processing tools described in OProfile.adoc#s1-oprofile-analyzing-data. See OProfile.adoc#s1-using-operf for further information. This mode consists of the opcontrol shell script, the oprofiled daemon, and several post-processing tools. The opcontrol command is used for configuring, starting, and stopping a profiling session. An OProfile kernel driver, usually built as a kernel module, is used for collecting samples, which are then recorded into sample files by oprofiled. You can use legacy mode only if you have root privileges. In certain cases, such as when you need to sample areas with disabled interrupt request (IRQ), this is a better alternative. Before OProfile can be run in legacy mode, it must be configured as shown in OProfile.adoc#s1-oprofile-configuring. These settings are then applied when starting OProfile (OProfile.adoc#s1-oprofile-starting). --pid=PID - this is to profile a running application, where PID is the process ID of the process you want to profile. With command and args, you can define a specific command or application to be profiled, and also the input arguments that this command or application requires. Either command, --pid or --system-wide is required, but these cannot be used simultaneously. When you invoke operf on a command line without setting the range option, data will be collected for the children processes. To run operf --system-wide, you need root authority. When finished profiling, you can stop operf with Ctrl+C. When running operf --system-wide, it is recommended that your current working directory is /root or a subdirectory of /root so that sample data files are not stored in locations accessible by regular users. With this option, you can specify a path to a vmlinux file that matches the running kernel. Kernel samples will be attributed to this binary, allowing post-processing tools to attribute samples to the appropriate kernel symbols. If this option is not specified, all kernel samples will be attributed to a pseudo binary named "no-vmlinux". Most processors contain counters, which are used by OProfile to monitor specific events. As shown in OProfile.adoc#tb-oprofile-processors, the number of counters available depends on the processor. The events for each counter can be configured via the command line or with a graphical interface. For more information on the graphical interface, see OProfile.adoc#s1-oprofile-gui. If the counter cannot be set to a specific event, an error message is displayed. when attempting to use operf, try profiling with opcontrol to see if your processor type may be supported by OProfile’s legacy mode. OProfile.adoc#tab_event_specifications summarizes these options. The last three values are optional, if you omit them, they will be set to their default values. Note that certain events do require a unit mask. The number of events to wait before sampling again. The smaller the count, the more frequent the samples. For events that do not happen frequently, a lower count may be needed to capture a statistically significant number of event instances. On the other hand, sampling too frequently can overload the system. By default, OProfile uses a time-based event set, which creates a sample every 100,000 clock cycles per processor. Unit masks, which further define the event, are listed in ophelp. You can insert either a hexadecimal value, beginning with "0x", or a string that matches the first word of the unit mask description in ophelp. Definition by name is valid only for unit masks having "extra:" parameters, as shown by the output of ophelp. This type of unit mask cannot be defined with a hexadecimal value. Note that on certain architectures, there can be multiple unit masks with the same hexadecimal value. In that case they have to be specified by their names only. The events available vary depending on the processor type. When no event specification is given, the default event for the running processor type will be used for profiling. See OProfile.adoc#tb-oprofile-default-events for a list of these default events. To determine the events available for profiling, use the ophelp command. The --separate-thread option categorizes samples by thread group ID (tgid) and thread ID (tid). This is useful for seeing per-thread samples in multi-threaded applications. When used in conjunction with the --system-wide option, --separate-thread is also useful for seeing per-process (i.e., per-thread group) samples for the case where multiple processes are executing the same program during a profiling run. The --separate-cpu option categorizes samples by CPU. Before OProfile can be run in legacy mode, it must be configured. At a minimum, selecting to monitor the kernel (or selecting not to monitor the kernel) is required. The following sections describe how to use the opcontrol utility to configure OProfile. As the opcontrol commands are executed, the setup options are saved to the /root/.oprofile/daemonrc file. First, configure whether OProfile should monitor the kernel. This is the only configuration option that is required before starting OProfile. All others are optional. In order to monitor the kernel, the debuginfo package which contains the uncompressed kernel must be installed. This command also loads the oprofile kernel module, if it is not already loaded, and creates the /dev/oprofile/ directory, if it does not already exist. See OProfile.adoc#s1-oprofile-dev-oprofile for details about this directory. Setting whether samples should be collected within the kernel only changes what data is collected, not how or where the collected data is stored. To generate different sample files for the kernel and application libraries, see OProfile.adoc#s2-oprofile-starting-separate. Use OProfile.adoc#tb-oprofile-processors to determine the number of events that can be monitored simultaneously for your CPU type. If the processor does not have supported performance monitoring hardware, the timer is used as the processor type. If timer is used, events cannot be set for any processor because the hardware does not have support for hardware performance counters. Instead, the timer interrupt is used for profiling. If timer is not used as the processor type, the events monitored can be changed, and counter 0 for the processor is set to a time-based event by default. If more than one counter exists on the processor, the counters other than 0 are not set to an event by default. The default events monitored are shown in OProfile.adoc#tb-oprofile-default-events. To configure OProfile, follow the instructions in OProfile.adoc#s1-oprofile-configuring. Replace event-name with the exact name of the event from ophelp, and replace sample-rate with the number of events between samples. By default, a time-based event set is selected. It creates a sample every 100,000 clock cycles per processor. If the timer interrupt is used, the timer is set to the respective rate and is not user-settable. If the cpu_type is not timer, each event can have a sampling rate set for it. The sampling rate is the number of events between each sample snapshot. Replace sample-rate with the number of events to wait before sampling again. The smaller the count, the more frequent the samples. For events that do not happen frequently, a lower count may be needed to capture the event instances. Be extremely careful when setting sampling rates. Sampling too frequently can overload the system, causing the system to appear frozen or causing the system to actually freeze. Some user performance monitoring events may also require unit masks to further define the event. Unit masks for each event are listed with the ophelp command. The values for each unit mask are listed in hexadecimal format. To specify more than one unit mask, the hexadecimal values must be combined using a bitwise or operation. Note that on certain architectures, there can be multiple unit masks with the same hexadecimal value. In that case they have to be specified by their names only. none — Do not separate the profiles (default). library — Generate per-application profiles for libraries. kernel — Generate per-application profiles for the kernel and kernel modules. all — Generate per-application profiles for libraries and per-application profiles for the kernel and kernel modules. If --separate=library is used, the sample file name includes the name of the executable as well as the name of the library. These configuration changes will take effect when the OProfile profiler is restarted. Using log file /var/lib/oprofile/oprofiled.log Daemon started. 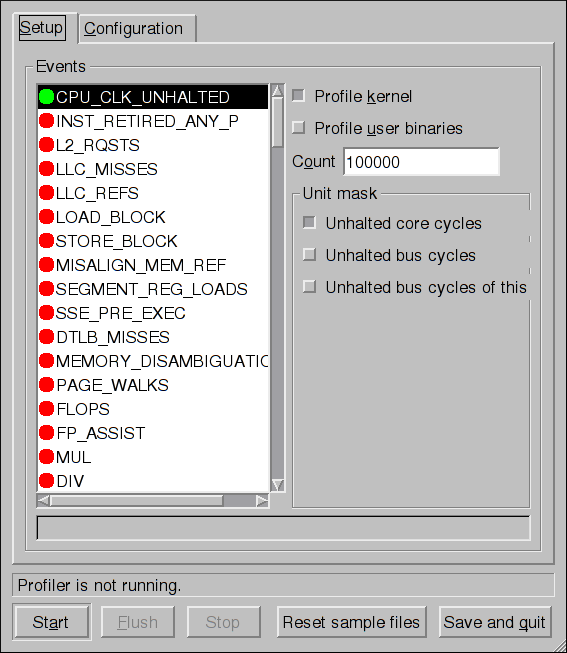 Profiler running. The settings in /root/.oprofile/daemonrc are used. The OProfile daemon, oprofiled, is started; it periodically writes the sample data to the /var/lib/oprofile/samples/ directory. The log file for the daemon is located at /var/lib/oprofile/oprofiled.log. On a Fedora 27 system, the nmi_watchdog registers with the perf subsystem. Due to this, the perf subsystem grabs control of the performance counter registers at boot time, blocking OProfile from working. Sometimes it is useful to save samples at a specific time. For example, when profiling an executable, it may be useful to gather different samples based on different input data sets. If the number of events to be monitored exceeds the number of counters available for the processor, multiple runs of OProfile can be used to collect data, saving the sample data to different files each time. The command creates the directory /var/lib/oprofile/samples/name/ and the current sample files are copied to it. To specify the session directory to hold the sample data, use the --session-dir option. If not specified, the data is saved in the oprofile_data/ directory on the current path. The same OProfile post-processing tools are used whether you collect your profile with operf or opcontrol in legacy mode. By default, operf stores the profiling data in the current_dir/oprofile_data/ directory. You can change to a different location with the --session-dir option. The usual post-profiling analysis tools such as opreport and opannotate can be used to generate profile reports. These tools search for samples in current_dir/oprofile_data/ first. If this directory does not exist, the analysis tools use the standard session directory of /var/lib/oprofile/. Statistics, such as total samples received and lost samples, are written to the session_dir/samples/operf.log file. Use these tools, along with the binaries profiled, to generate reports that can be further analyzed. The executable being profiled must be used with these tools to analyze the data. If it must change after the data is collected, back up the executable used to create the samples as well as the sample files. Note that the names of the sample file and the binary have to agree. You cannot make a backup if these names do not match. As an alternative, oparchive can be used to address this problem. Samples for each executable are written to a single sample file. Samples from each dynamically linked library are also written to a single sample file. While OProfile is running, if the executable being monitored changes and a sample file for the executable exists, the existing sample file is automatically deleted. Thus, if the existing sample file is needed, it must be backed up, along with the executable used to create it before replacing the executable with a new version. The OProfile analysis tools use the executable file that created the samples during analysis. If the executable changes, the analysis tools will be unable to analyze the associated samples. See OProfile.adoc#s1-oprofile-saving-data for details on how to back up the sample file. Each executable is listed on its own line. The first column is the number of samples recorded for the executable. The second column is the percentage of samples relative to the total number of samples. The third column is the name of the executable. See the opreport(1) manual page for a list of available command-line options, such as the -r option used to sort the output from the executable with the smallest number of samples to the one with the largest number of samples. You can also use the -t or --threshold option to trim the output of opcontrol. The first column is the number of samples for the symbol, the second column is the percentage of samples for this symbol relative to the overall samples for the executable, and the third column is the symbol name. To sort the output from the largest number of samples to the smallest (reverse order), use -r in conjunction with the -l option. The first line is a summary for the symbol/executable combination. The first column is the number of samples for the memory symbol. The second column is the percentage of samples for the memory address relative to the total number of samples for the symbol. The third column is the symbol name. The data is the same as the -l option except that for each symbol, each virtual memory address used is shown. For each virtual memory address, the number of samples and percentage of samples relative to the number of samples for the symbol is displayed. With this option, you can exclude some symbols from the output. Replace symbol-name with the comma-separated list of symbols you want to exclude. Here, you can specify the full path to the session, a directory relative to the /var/lib/oprofile/samples/ directory, or if you are using operf, a directory relative to ./oprofile_data/samples/. OProfile collects data on a system-wide basis for kernel- and user-space code running on the machine. However, once a module is loaded into the kernel, the information about the origin of the kernel module is lost. The module could come from the initrd file on boot up, the directory with the various kernel modules, or a locally created kernel module. As a result, when OProfile records samples for a module, it just lists the samples for the modules for an executable in the root directory, but this is unlikely to be the place with the actual code for the module. You will need to take some steps to make sure that analysis tools get the proper executable. To get a more detailed view of the actions of the module, you will need to either have the module "unstripped" (that is installed from a custom build) or have the debuginfo package installed for the kernel. Find out which kernel is running with the uname -a command, obtain the appropriate debuginfo package and install it on the machine. warning: could not check that the binary file /lib/modules/2.6.32-191.el6.x86_64/kernel/fs/ext4/ext4.ko has not been modified since the profile was taken. Results may be inaccurate. The opannotate tool tries to match the samples for particular instructions to the corresponding lines in the source code. The resulting generated files should have the samples for the lines at the left. It also puts in a comment at the beginning of each function listing the total samples for the function. For this utility to work, the appropriate debuginfo package for the executable must be installed on the system. On Fedora, the debuginfo packages are not automatically installed with the corresponding packages that contain the executable. You have to obtain and install them separately. These command-line options are mandatory. Replace src-dir with a path to the directory containing the source code and specify the executable to be analyzed. See the opannotate(1) manual page for a list of additional command line options. A directory exists in /dev/oprofile/ for each counter. For example, if there are 2 counters, the directories /dev/oprofile/0/ and /dev/oprofile/1/ exist. count — The interval between samples. enabled — If 0, the counter is off and no samples are collected for it; if 1, the counter is on and samples are being collected for it. event — The event to monitor. extra — Used on machines with Nehalem processors to further specify the event to monitor. kernel — If 0, samples are not collected for this counter event when the processor is in kernel-space; if 1, samples are collected even if the processor is in kernel-space. unit_mask — Defines which unit masks are enabled for the counter. user — If 0, samples are not collected for the counter event when the processor is in user-space; if 1, samples are collected even if the processor is in user-space. Determine which applications and services are used the most on a system — opreport can be used to determine how much processor time an application or service uses. If the system is used for multiple services but is underperforming, the services consuming the most processor time can be moved to dedicated systems. Determine processor usage — The CPU_CLK_UNHALTED event can be monitored to determine the processor load over a given period of time. This data can then be used to determine if additional processors or a faster processor might improve system performance. OProfile allows you to profile dynamically compiled code (also known as "just-in-time" or JIT code) of the Java Virtual Machine (JVM). OProfile in Fedora 27 includes built-in support for the JVM Tools Interface (JVMTI) agent library, which supports Java 1.5 and higher. Currently, you can add one command-line option: --debug, which enables debugging mode. The oprofile-jit package must be installed on the system in order to profile JIT code with OProfile. With this package, you gain the capability to show method-level information. Depending on the JVM that you are using, you may have to install the debuginfo package for the JVM. For OpenJDK, this package is required, there is no debuginfo package for Oracle JDK. To keep the debug information packages synchronized with their respective non-debug packages, you also need to install the yum-plugin-auto-update-debug-info plug-in. This plug-in searches the debug information repository for corresponding updates. To learn more about Java support in OProfile, see the OProfile Manual, which is linked from OProfile.adoc#s1-oprofile_additional_resources. Some OProfile preferences can be set with a graphical interface. Make sure you have the oprofile-gui package that provides the OProfile GUI installed on your system. To start the interface, execute the oprof_start command as root at a shell prompt. After changing any of the options, save them by clicking the Save and quit button. The preferences are written to /root/.oprofile/daemonrc, and the application exits. Exiting the application does not stop OProfile from sampling. On the Setup tab, to set events for the processor counters as discussed in OProfile.adoc#s2-oprofile-events, select the counter from the pulldown menu and select the event from the list. A brief description of the event appears in the text box below the list. Only events available for the specific counter and the specific architecture are displayed. The interface also displays whether the profiler is running and some brief statistics about it. On the right side of the tab, select the Profile kernel option to count events in kernel mode for the currently selected event, as discussed in OProfile.adoc#s2-oprofile-starting-separate. If this option is not selected, no samples are collected for the kernel. Select the Profile user binaries option to count events in user mode for the currently selected event, as discussed in OProfile.adoc#s2-oprofile-starting-separate. If this option is not selected, no samples are collected for user applications. Use the Count text field to set the sampling rate for the currently selected event as discussed in OProfile.adoc#s3-oprofile-events-sampling. If any unit masks are available for the currently selected event, as discussed in OProfile.adoc#s3-oprofile-events-unit-masks, they are displayed in the Unit Masks area on the right side of the Setup tab. Select the check box beside the unit mask to enable it for the event. On the Configuration tab, to profile the kernel, enter the name and location of the vmlinux file for the kernel to monitor in the Kernel image file text field. 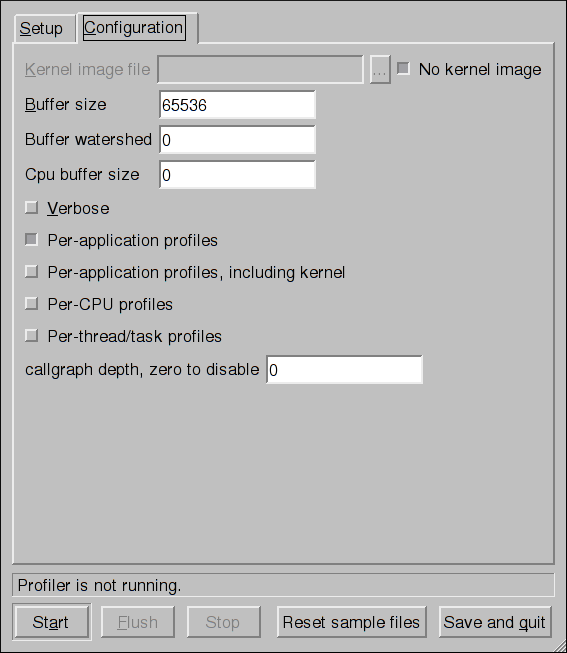 To configure OProfile not to monitor the kernel, select No kernel image. If the Verbose option is selected, the oprofiled daemon log includes more detailed information. If Per-application profiles is selected, OProfile generates per-application profiles for libraries. This is equivalent to the opcontrol --separate=library command. If Per-application profiles, including kernel is selected, OProfile generates per-application profiles for the kernel and kernel modules as discussed in OProfile.adoc#s2-oprofile-starting-separate. This is equivalent to the opcontrol --separate=kernel command. To force data to be written to samples files as discussed in OProfile.adoc#s1-oprofile-analyzing-data, click the Flush button. This is equivalent to the opcontrol --dump command. To start OProfile from the graphical interface, click Start. To stop the profiler, click Stop. Exiting the application does not stop OProfile from sampling. SystemTap is a tracing and probing tool that allows users to study and monitor the activities of the operating system in fine detail. It provides information similar to the output of tools like netstat, ps, top, and iostat; however, SystemTap is designed to provide more filtering and analysis options for the collected information. While using OProfile is suggested in cases of collecting data on where and why the processor spends time in a particular area of code, it is less usable when finding out why the processor stays idle. You might want to use SystemTap when instrumenting specific places in code. Because SystemTap allows you to run the code instrumentation without having to stop and restart the instrumented code, it is particularly useful for instrumenting the kernel and daemons. For more information on SystemTap, see OProfile.adoc#br-oprofile_online_documentation for the relevant SystemTap documentation. To learn more about OProfile and how to configure it, see the following resources. http://oprofile.sourceforge.net/ — Contains the latest upstream documentation, mailing lists, IRC channels, and more. SystemTap Beginners Guide — Provides basic instructions on how to use SystemTap to monitor different subsystems of Fedora in finer detail.